"...There are several, comical voiceovers by Christine Torreele as Sheryl, the secretary who seems to know it all with eyes in the back of her head and ears as large as Dumbo! Set design by Kurtis Bedford, lighting design by Ellen Monocroussos, and costume design by Sarah Rekow enhance the overall artistic representation of two people from such different worlds who manage to meet center stage in front of Eternal Light resting above the most holy of places in the Jewish faith. May its essence follow you in spirit after seeing the play." 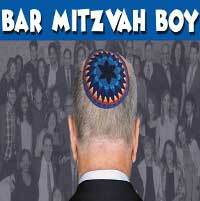 "...In his opening curtain speech for Bar Mitzvah Boy at the Miles Playhouse in Santa Monica, director Howard Teichman — who is also artistic director of the West Coast Jewish Theatre — told the audience that he has “scoured the country and beyond, looking for the next Neil Simon, the next Arthur Miller, the next great Jewish playwright.” The fact that his “search” has led him to Mark Leiren-Young’s Bar Mitzvah Boy is somewhat mystifying." "...One would suspect that the title BAR MITZVAH BOY would be more of a coming of age story through the persona of a young lad. Actually, it is a coming of age tale. However, the young lad isn't as young as he used to be. And the rabbi is more than just a leader of an assembly of faith followers. This production would appeal to any theater attendee that enjoys an intense character study, no matter if one is Jewish, gentile, or some other else. It's never too soon nor too late to keep the faith!"